Neil Simpson is a Sunday Times Top Ten best-selling biographer and one of Britain’s most prolific ghost-writers. His back list includes highly commercial books for the likes of Orion, Hodder & Stoughton, Virgin, Mainstream, Penguin and John Blake Publishing.He is happy to meet very tight deadlines and has co-written with celebrities, television personalities, chefs and musicians, as well as an increasing number of ‘ordinary’ people who have lived extraordinary lives. Over the years his books have been serialised in the Daily Star, the Mail on Sunday, the Daily Telegraph and The Sunday Times and translated into half a dozen languages including German, Polish and Czech. He has sold TV rights in the UK as well as in Italy, Germany and Australia. 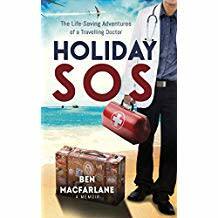 Reviews for Hodder & Stoughton’s Holiday SOS, co-authored with Ben MacFarlane and the first book Neil sold through Andrew Lownie, include: ‘It’s terrific’ The Independent, ‘Editor’s Choice’ The Sunday Times, ‘A barn-storming account’ Libby Purves on Radio 4, ‘Eye-opening and entertaining,’ Press Association and ‘Hugely entertaining’ The Lady. When he isn’t writing books Neil has started talking about them at literary festivals and other events. He lives in London, is lucky enough to travel widely, and is always ready to consider new projects. A list of Neil’s ghost-written books is available on request – though confidentiality to co-authors must be respected. His biographies include the lives of Paul O’Grady, Billie Piper, Jonathan Ross and Gordon Ramsay. I was quite mercenary in my search for an agent – I wanted to find the one who was doing the most business for his or her clients. Andrew Lownie’s name seemed to come up whenever I saw good deals signed for authors I admired – for serialisations as well as book rights. I also liked the fact that his back list of books and authors gives him a huge amount of credibility in the industry, as does his connection with The Biographers’ Club. When we met I was hugely inspired by Andrew’s enthusiasm for all types of books and I hope we produce plenty of great ones over the years ahead.